The reading from the Holy Gospel today is Luke 9: 37-43. At that time, it came to pass, that on the next day, when they were come down from the hill, much people met Jesus. And, behold, a man of the company cried out, saying, Master, I beseech thee, look upon my son: for he is mine only child. And, lo, a spirit taketh him, and he suddenly crieth out; and it teareth him that he foameth again, and bruising him hardly departeth from him. And I besought thy disciples to cast him out; and they could not. And Jesus answering said, O faithless and perverse generation, how long shall I be with you, and suffer you? Bring thy son hither. And as he was yet a coming, the devil threw him down, and tare him. And Jesus rebuked the unclean spirit, and healed the child, and delivered him again to his father. And they were all amazed at the mighty power of God. The “hill” in this passage is Mount Tabor, and “they” are the Lord with Peter, James and John. They have just come down from the mountain after the Lord’s Transfiguration. The apostles’ joy at beholding the Lord in glory before their very eyes had caused Peter to ask if they could not perhaps pitch little tents for Christ to dwell there with Moses and Elias, and all of them could just stay there for a bit…”Lord, it is good for us to be here.” This, however, was not to be, for Christ had yet to go forth and complete His awesome exploit for our salvation. They had had to descend the mountain. We do not understand our real situation unless we fully comprehend and accept the reality that this world we live in is fallen. Billions of sinful men, whom we see, occupy it, and by their own power they can do only evil or good mixed with evil – the result, ultimately, is the same – and they will keep doing evil till the end of time, and they would do so with no encouragement whatsoever. They do, however, receive such encouragement, from malignant spirits, whom we cannot see, far outnumbering the men and far more powerful than they, who constantly aggravate each man’s tendency to sin in a thousand artful ways, and actually inhabit men’s minds and even their bodies. Out of His mercy and love for man, the Lord closed the spiritual eyes of our first parents after the Fall, and subsequently those of all their descendants, so that we cannot see these creatures. But they are there. This realization should, to put it mildly, give us a sober outlook on life. It puts all of our Orthodox customs and practices into the only context in which they make sense: this short earthly life as an arena for spiritual combat. When understood fully, it confronts us with The Choice: God or the devil, heaven or hell. There is no Third Way, no separate peace. No one is allowed to sit this one out. The Good News is that the billions of devils and sinful men are outnumbered by One – the Almighty God Who created them and holds them in unbreakable chains, subject to His sovereign will. This One loves us, and He has done, is doing, and will do everything for our salvation. We have only to believe in Him as He desires to be believed in, worship Him as He desires to be worshipped, and serve Him as He desires to be served. This belief, this worship, and this way of life constitute what we call Orthodoxy. They are the invincible armor and irresistible weapons that enable us to overcome the World, the Flesh and the Devil. We can deflect anything the bad guys throw at us. In a few days, we shall begin the holy fast for the Lord’s Nativity. What a wonderful and simple weapon the Lord through Holy Church has given us: to deny ourselves in this very basic, very simple way, and so in simple and humble obedience acquire His grace to overcome our invisible foes. In both St. Matthew’s and St. Mark’s account of the exorcism related above by St. Luke, the Lord afterwards explains to the disciples that “this race [in Greek γένος – literally this genus, this type of creature, a demon] cannot be cast out except by prayer and fasting.” When we fast, we are joining ourselves to the Lord Himself, Who as a man really and truly fasted while on earth. When we pray, we are uniting ourselves to Christ, Who as a man really and truly prayed to His heavenly Father. What an immeasurable honor – to do as the God-Man did! What invincible weapons – those wielded by the God-Man Himself! With Him, we cannot fail. Let us “serve the Lord with fear and rejoice in Him with trembling (Ps. 2).” We live in godly fear until the end of our earthly pilgrimage, and we simultaneously rejoice, living in hope of our eventual victory. 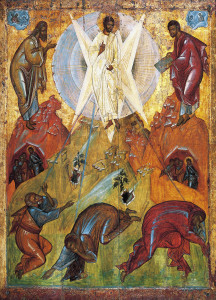 May the Lord, Who revealed our true destiny in His Transfiguration, give us the grace to serve Him in prayer and fasting this Nativity Fast and all the days of this temporal life, so that we may tabernacle with Him on the summit of the heavenly Sion, where our vision of His beauty will have no end.